After several more jumps, system scanning and fuel scooping I arrived at Thors's eye today. 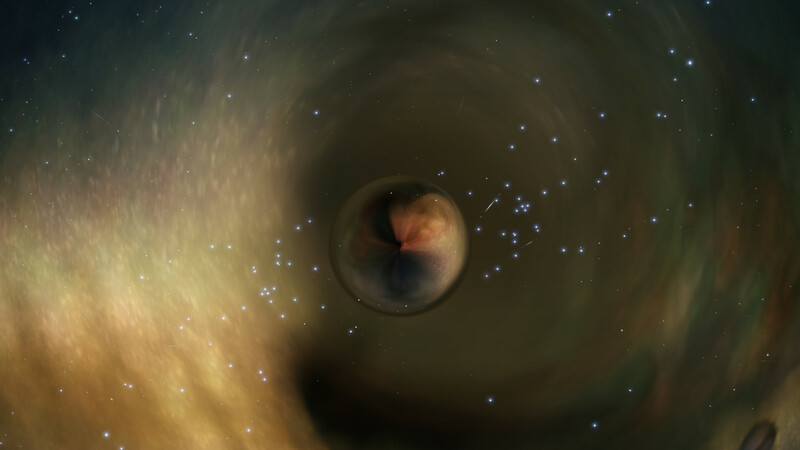 I'd heard lots of stories about black holes and how amazing they are to visit so I nonchalantly started to super cruise away from the massive white A class main star and travel 6,740 ls over to the Thors's Eye B Black Hole. I could only make out a slight distortion at first but the closer I got the more the distortion grew, warping all the stars that were around it. I should rephrase that; the starts are not actually around it as they are all light years away but it was distorting the visual space around itself giving that impression. It was quite mesmerising, I slowly crept up closer and closer, almost entranced by what I could see. The galaxy plane suddenly shifted where the hole was and started twisting, tighter and tighter, spiralling inwards. I was suddenly jolted back to reality as the ship lurched forward, lights started to flash and "Body Exclusion Zone Hit" appeared on my warning panel, the ship span out of control momentarily before I gain control. Panic set in immediately, had I just been pulled in? Was I still getting pulled in? I flipped the ship around 180 degrees, diverted power to engines and boosted and kept boosting. I then realised I was ok, heat was high but not rising by much and I was moving away from the thing. I might not be in a position to do this again, I thought, so I deployed my photo drones and put my control goggles on, flying the drones round the ship taking pictures of this crazy spectacle. However, a smell wafted into my nose. I ripped the goggles of my face and saw the whole dash starting to smoke, warning lights flashing, and the temperature gauge was in the red. I quickly dumped a heat sink but by the time it ejected, and my temperature started to drop I had already started to take damage, sparks leaping of my console. I started spooling up the FSD and dumped another heat sink as the temperature started to peak again. Then "3,2,1, engage" I was into super cruise and moving away from the black hole and my temperatures were stabilising. Glancing at my module panels I was relieved that I'd only take a few percent damage on a a couple of modules and only 2 % heat damage on my hull. I really need to stay focused out here, but it is so easy to get caught up in the beauty of it all. I jumped on from star to star, briefly stopping in undiscovered systems to do full scans and even fully map a few interesting planets with probes. Several hours later I could make out the Lagoon Nebula, an amazingly red and green nebula, that was until recently, creating stars in the Open Cluster NGC 6530. Flying on, I then could make out The Moth Nebula a few hours later, which more resembled a letter N to me. After a brief sleep and some food, I pushed on, keen to get to the Omega Mining Station, now having heard from Galnet that the plans for the mining operation for the new station at the centre of the galaxy had been finalised.